UT System after getting his undergraduate degree. Growing up "with burnt orange" in his veins, Clay Allison was always keenly aware of his family’s strong commitment and connection to the UT System. 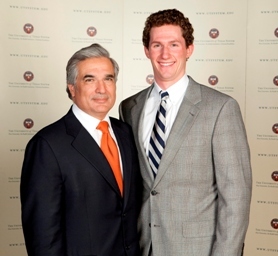 After graduating from The University of Texas at Austin (B.A., History, ’10), he assumed there would be a formal program in place to help him and other young graduates maintain that connection, much like the Chancellor’s Council his father belongs to. And when he realized there wasn’t such a program for younger alumni, he decided he wanted to be part of creating one. He discussed his thinking with his father, Les Allison (B.B.A., ’79), who serves on the Chancellor’s Council Executive Committee. Together with Vice Chancellor Randa Safady and members of the Office of External Relations, they came up with the idea for the Centurions program. Upon sharing the idea with Chancellor Francisco Cigarroa, they received an enthusiastic response and quickly secured the chancellor’s support. "It was very exciting to work with the generations who came before me to find a way to help my generation and future generations be of service within the UT System starting early in our adult lives," says Clay. Within a few months, the Centurions program had more than 40 members, each of whom represents a different part of the UT System – and all of whom were chosen in recognition of their devotion to the system and their commitment to giving back in whatever way they can. As a group, the members are eager to identify opportunities they will have to serve the UT System in particular and higher education in general. "We are engaging with Chancellor Cigarroa, the Chancellor’s Council and the leaders of the different universities and health institutions in the system to familiarize ourselves with key issues they face, and to determine the best ways for us to get involved with those issues," reports Clay. Through their extensive contact with UT System leadership, the members of the group are getting a solid understanding of the challenges in higher education and health care today. This will fully prepare them to pursue whatever avenues they determine will be most effective in enabling them to make an impact. As for Clay, he looks forward to continuing to watch the group take shape. "There are so many routes it could take, there’s a bit of the unknown at this point—and to me, that’s very exciting."